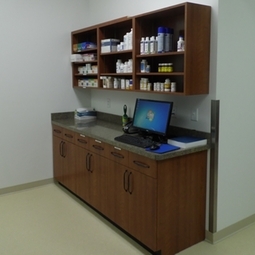 We have an on site pharmacy for your convience. We carry the most commonly used medications. If you prefer to have your pet's medications filled elsewhere, just let us know and we would be happy to write a prescription for you. Keep in mind that we will have had to have seen your pet within the last year to dispense medications or write prescriptions. Some medications require regular monitoring bloodwork to be performed to refill medications. We also have a drive through pick up window for your added convience.